The Alumnus: Hello. I was in town, and I wanted to stop in for a visit. The Visionary: How good to see you! What have you been up to? We’re all interested in hearing what our alumni are doing. The Alumnus: Well, that would take a bit of explaining. I had a good experience with college. The Visionary: That’s lovely to hear. The Alumnus: Yes, and I know that some alumni from our Illinois Mathematics and Science Academy, also known as IMSA, didn’t. I got through college the same way I got through gradeschool, playing by the law of the jungle. I stopped and thought about how to approach college. I realized soon that higher numbered courses were easier than lower numbered courses, and how to find professors I could work with. And I understand why one alumna said, “IMSA didn’t prepare me for college. It prepared me for graduate school.” College will not automatically be a good experience for IMSA students, but there are choices the college won’t advertise but could be made. The Visionary: I wish you could speak to some of our students. The Alumnus: I’d like the opportunity. There are a lot of things to say—that there’s a normal scale of elementary-junior high-high school-undergraduate-graduate school, and IMSA doesn’t fit on it. It has high school aged students, but it’s not a modified high school; it’s close in ways to graduate school, but there’s something about it that is missed if you put it at any one point on the scale. And this has the result that IMSA students need to realize that when they enter college, they are not going from high school to the next step after high school; they’re going from IMSA to something that was not meant to follow IMSA. But something that has opportunities if they knock on back doors and take advantage of some things the university doesn’t know they need. The Visionary: If you’re serious about talking to our students, I mean talking with our students, I can introduce you to the appropriate people. The Alumnus: Thank you. I was mentioning this to lead up to a gem of a class I took, one on what you need to know to make user-friendly computer programs, i.e. usability. There was something that set me thinking, nettled me, when I was reading through some of the jargon file’s Hell desk slang, um, I mean help desk slang. The term “pilot error” meant much the same thing as “ID ten T error”. The Visionary: I know what “pilot error” means in some contexts, but what does “ID ten T error” mean? The Alumnus: It’s easiest to see if you write it out. The Visionary [goes to a markerboard and writes, “I D 1 0 T” ]: Um… I assume there’s a reason you started to say, “Hell desk.” Aren’t they just blowing off steam? The Alumnus: Yes. Unfortunately, one of the ways many help desk employees have blown off steam is to say, “Ok. If you’ll hold for a minute, I’m going to transfer you to my supervisor. Would you tell her that you appear to have an ‘eye dee ten tee’ error?” And they all gloat over what they’ve gotten the customer to say. No, seriously, you don’t need to keep a straight face. Did you figure out why that guy couldn’t print? Yeah, he kept canceling the print operation before it could finish. PEBKAC. The Alumnus: In a computer, you get these time wasting messages where a little window pops up and you can’t do any useful work until you click on the button. It becomes noise for the sake of noise; like the boy who cried, “Wolf!”, we have the computer that cries, “Worth your attention.” After a while, the normal thing most people do is click on the button automatically so they can get back to their work. It’s a waste of time to try to decipher the cryptic messages. So when people go to print, another one of these waste-of-time windows pops up, except that this time, when you do the right thing and click on the button and make it go away, your print job fails. And this specific example is chosen as a paradigm example of PEBKAC. For a lot of these errors, there is a problem between a keyboard and chair. But the problem isn’t between the user’s keyboard and chair. The problem is between the programmer’s keyboard and chair. The Alumnus: That course was what led to what I did for my Ph.D. The Visionary: And that was? The Alumnus: My discipline of record is philosophy of mind/cognitive science. The Visionary: “Discipline of record?” I’m curious to hear you drop the other shoe. The Visionary: That way of putting it makes the programmers sound ego-centric. The Alumnus: I wouldn’t put it in such crude terms as that; they are thinking in a way that is human. With languages, there is a lot of diversity. Aside from the variety of languages, there’s a difference between the U.S., where the majority only speak one language, and Sénégal, where it is common for people to speak five or six languages. There’s a difference between Italy, where people speak one national language in a fairly pure form, and India, where English and Hindi are spliced together seamlessly. For that matter, there’s the deaf outlet of speaking with your hands instead of your mouth. But with all these differences, language itself is not something which is added to being human. Language is not a custom that cultures may happen to include. There are exceptional cases where people do not learn a language, and these are tragic cases where people are deprived of a human birthright. The specifics of language may vary, but language itself is not adding something to being human. It is something that is basically human. The details and even diversity of languages are details of how language works out. And a lot of things are like that. Understanding something that you’re working on is not something added to being human; it’s an interpretation of something basic. How one thinks, about technology and other things, is not something added to being human. It’s something basically human. One very natural tendency is to think that “I” or “we” or “people like us” are just being human; we just have what is natural to being human. The “them” group has all sorts of things that are added to being human, but “we” are just being human. So we expect other people to think like us. We assume it so deeply and unconsciously that we are shocked by their perversity when they violate this expectation. The Visionary: Wow. I hadn’t thought of it in those terms before. Do you think IMSA provided a safe haven from this kind of lockstep thinking for its students? The Alumnus: So I began, encouraged by some initial successes, to try and make the first artificial mind. For a while I thought I would succeed, after overcoming some obstacles that couldn’t have been that bad. The Visionary: What were these obstacles? The Alumnus: Just a special case here and there, an unrepresentative anomaly. But when I worked, I had a sneaking suspicion dawn on me. Freshman year, I had a college roommate who was brilliant and eccentric. He turned out stunning proofs in math classes. He was also trying to build a perpetual motion machine. He was adjusting this and that; I listened, entranced, when he traced the history of great experiments in physics, and talked about how across the centuries they went from observing obvious behavior to find subtle ways to trick nature into showing you something you weren’t supposed to see. Think of the ingenuity of the Millikan oil drop experiment. And so he went on, trying to adjust this and that, seeking to get things just right for a perpetual motion machine. There were times when he seemed to almost have it. It seemed there were ten things you needed for a perpetual motion machine, and he had an almost working machine for any nine of them. But that tenth one seemed never to fall into place. And I had a sneaking suspicion, one that I was going to try awfully hard to ignore, that for a long time I convinced myself I didn’t know what I was expecting. But deja vu kept creeping in. I had just succeeded with a project that met every clearly defined goal I set for it… but I had just found another way not to make artificial intelligence. The crusher was when I read von Neumann’s 1958 The Computer and the Brain. Then I stopped running from deja vu. Here was crass confidence that in 1958 we discoved the basis for all human thought, and all human thought is add, subtract, multiply, and divide. Here was an assumption in lieu of argument. And here was the air I breathed as a cognitive science. The Visionary: But I’ve looked at some reports, and artificial intelligence seems to be just around the corner. The Alumnus: Full artificial intelligence is just around the corner, and it’s been just around the corner since at least the fifties—arguably much longer, because for a hundred years before the brain was a computer, it was a telephone exchange. (I think that’s why we talk about a person being “wired” a particular way.) The brain is always understood as the state of the art technology we’re most proud of. I hit rock bottom after thinking about how I had convinced myself I was creating a working artificial intelligence by obtaining results and reinterpreting results as success. It’s very seductive, and I was thinking about what some skeptics had said about magic. What emerged was… The effort to make computers think has found ways that the human mind is much more interesting than we thought. And I began to push in a new direction. Instead of trying to understand human intelligence to make computers more intelligent, I began to try to understand human intelligence to make humans more intelligent. The Visionary: What exactly do you mean? The Visionary [pausing]: It sounds like you’re pioneering a new academic discipline. Would you like IMSA to highlight this? The Alumnus: I am working that out. Not exactly whether what I am doing would qualify as an academic discipline—I’m pretty sure of that—but whether going down that route would be the wisest choice. For now, I’d rather wait. The Visionary: Are you sure you wouldn’t want the prestige? Hmm… on second thought, I can see that. What are the scientific underpinnings of your discipline? The Alumnus [pause]: That question is one of the first ones people ask me. It’s automatic. In tandem with what you might call my loss of faith in cognitive science, I began to question the cultural place of science. Including that in a question like this, the nearly immediate question people ask is one that assumes the answers are fed by science. Three of the most difficult mental accomplishments I’ve made are learning to think like a scientist, crafting this discipline of how to think, and learning to genuinely ask “How else could it be?” when people automatically go charging in with science. The Visionary: But don’t you think it’s important to understand what’s going on in the body? The Alumnus: Both your questions, “What are the scientific underpinnings of your discipline?” and “But don’t you think it’s important to understand what’s going on in the body?” are examples of the tendency I’m talking about. Your latter question assumes that “understanding the body” and “study the science of the body” are interchangeable terms; they often are treated that way in Western culture, but they need not be. The Visionary: But how else could it be? The Alumnus: In journalism and some writing classes, students are taught a technique of cubing, which asks six questions, one for each side of the cube. The six questions are all “w” words: who, what, when, where, and how. In most aboriginal cultures, for instance, people ask more than one question, but the big question is, “Why?” The stories provide explanations for why the world is as it is. That puts things too simply, but my point is that science does not represent the full range of inquiry. Science has cast a powerful shadow, not just in that science is scientific (which is as it should be) but in that non-scientific inquiry is not as independent as it should be. But I’m getting off topic. What I was meaning to say was that I use science, but my discipline is dependent on an independence from science as well. The Visionary: Could I backtrack a fair distance? The Alumnus: Sure, to what? The Visionary: There was something in the back of my mind when you answered my question about IMSA shielding its students from a lockstep environment. May I ask a more specific question? The Visionary: Did IMSA shield you from a lockstep environment? The Alumnus: IMSA was unquestionably a better environment for me than a mainstream school. The Visionary: You’re being diplomatic. The Alumnus: Ok. IMSA tries to be a magnet school serving the gifted population. Instead of memorization, it tries to produce critical observers, right? The Visionary: Yes, and this isn’t just for IMSA. We want to be a beacon of hope, for educational progress to the state and to the world. The Alumnus: IMSA still doesn’t have a football program, right? The Visionary: IMSA students still don’t really want one. If there was enough demand, we’d have one. The Alumnus: What would you say to a football coach who wanted to liberate the tough, aggressive quarterback struggling to get out of every IMSA bookworm? The Visionary: I think I see where you’re going. Let me play devil’s advocate for the moment. Our society has recognized football as an endeavor for some. But don’t we recognize that education is a goal for all? The Alumnus: All analogies break down, and I can’t force you to see my point if you don’t want to. My reason for drawing that analogy is that the average mind learns by memorization of given material, and that mind is ill-served by trying to liberate that critical observer just as many bookworms would be ill-served by trying to liberate that hidden quarterback. The kind of student that does well at IMSA doesn’t do so well with the memorization that serves the average student. But it’s a two-way street. The Alumnus: Yes. But there’s something else. The Visionary: So how do you think IMSA’s outreach should be changed? Should we stop outreach? The Alumnus: I’d want to give that some thought. That isn’t why I brought this up. I brought up this two-edged sword to make it easier to see another two-edged sword. The two-edged sword I’ve suggested is that, just as IMSA students tend to be uncomfortable with the instructional methods at most schools, average students would be uncomfortable with instruction that seeks to liberate a hidden critical observer. It’s a bad match both ways. The other two-edged sword has to do with the nature of giftedness. How would you define giftedness? The Visionary: I try not to, at least in not as strong terms as you do. IMSA is trying to liberate the genius of every child. The Alumnus: I think your actions are wiser than your rhetoric. How much thought goes into your admissions decisions? The Visionary: Our admissions staff give a great deal of thought! Do you think we’re careless? The Alumnus: I would have been disturbed if IMSA made a random choice from among the students whose genius would be nurtured. 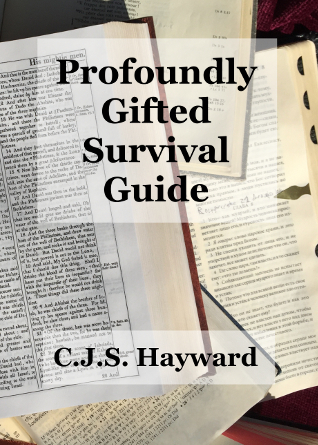 Are you sure you don’t want to define giftedness? The Visionary: Every child has some talent. But you are, unlike me, an administrator whom everybody blames for problems, and you know that there are many occasions where coming out and expressing your candid opinions is an invitation to disaster. I groused about the administration to no end as a student; it is only as an adult that I’ve come to appreciate the difficult and delicate task of being an administrator, and what kind of performance on an administration’s part lets me focus on my work. I’m going to put on my suspicious and mistrustful observer cap and read into your actions that it would be politically dangerous for you to say “This is the kind of gifted student we look for at IMSA.” But I am not an administrator. I am more of a private person than you can afford to be, and there are more degrees of freedom offered to me. Would you mind my giving my opinion on a matter where you in particular need to be very careful in what you say? The Visionary: I’m always open to listen, and I’m not just saying this as an administrator. But when I teach, I try to have a map that accomodates itself to terrain, both old and new to me. There are surprisingly many things I believe that are human universals, although I won’t discuss them here. But diversity is foundational to how I communicate, and in particular teach. By “diversity” I don’t just mean “affirmative action concerns.” I read what I can about minority cultures, and how Asperger’s or ADD minds tick. That much is important, and I’m not just jumping on the bandwagon. But diversity doesn’t begin when a student labeled as “minority,” “different,” or “disadvantaged” sits down in your classroom. Diversity begins much earlier. Diversity is every person. I’m fond of books like David Kiersey’s Please Understand Me II which explore what temperament and Myers-Briggs types mean for personhood. I want to appreciate learning styles. I absolutely love when students come in during office hours, because then I can see exactly where a student is, and exactly how that student is learning and thinking, and give an explanation that is tailored to the student’s specific situation. I like to lecture too, but I’m freest to meet student needs when students visit me in my office. And one very important facet of that diversity is one that is unfashionable today, more specifically IQ. The Visionary: I remember seeing a report that your IQ was so high it was untestable by normal means. I’ve heard that polite drivers value politeness, skillful drivers value skill, and safe drivers value safety. Is there…? The Alumnus: If you want to dismiss what I’m saying because of speculation about my motives, there’s a good case to do so. I know that. But please hear and accept or dismiss my arguments on their merits, and if you read books like James Webb’s Guiding the Gifted Child, you’ll see this isn’t just my idea. I accept multiple intelligence theory as a nuance, but I would point my finger to the idea that a single IQ was an adjustment in theory, made by people who started by assuming multiple intelligences. But with all the debates, and in particular despite the unfashionability of “IQ”, there is excellent reason to discuss giftedness in terms of IQ. IQ may not be the whole story, but you’re missing something big if it is treated as one factor among others. Several caveats deleted, I would point out that giftedness is not a binary attribute, any more than being tall is binary. There may be some people who are clearly tall and others who clearly aren’t, but regardless of where you draw the line, you can’t divide people into a “tall” group of people who are all exactly 190 centimeters tall and a “non-tall” group of people who are 160 centimeters tall. There is diversity, and this diversity remains even if you restrict your attention to tall people. The Visionary: So then would you say that most high schools serve an average diversity, and IMSA serves a gifted diversity? The Alumnus: And IMSA breaks at both ends of its spectrum. The Alumnus: That’s not my point. Ignoring several other dimensions of diversity, we don’t have two points of “average” and “gifted” defining a line. Giftedness, anyway, is not “the same kind of intelligence as most people have, only more of it and faster”; it’s a different kind of intelligence. It diverges more the further you go. I think it is to IMSA’s great credit that you have a gifted education, not a pullout tacked on to a nongifted education. Serving gifted needs isn’t an adjustment; it’s the fabric you’ve woven, and it is impressive. …and the position of the profoundly gifted at IMSA is exactly the position many IMSA students had in TAG pullouts. The Visionary: May I say a word in IMSA’s defense? The Visionary: IMSA began as a dream, a wild, speculative, powerful, risky vision. From the beginning, its place was tentative; some of the first classes did math problems before the state government because IMSA was threatened with closing. IMSA makes things happen that wouldn’t happen anywhere, and for all we’ve done, there are still people who would remove us from the budget. I’ve talked with alumni, both those who like and dislike the school, and I see something in them which I didn’t see in other places. The Alumnus: And IMSA is a safe place to learn and grow, and IMSA alumni are making a powerful contribution to the world. All of this I assume. And IMSA seems like the kind of place that could grow, that does grow. IMSA could offer the world certain extraordinarily talented individuals that have been stretched to their limit, who have spent certain very formative years doing things most people don’t even dream of, and doing so not in isolation but guided and supported as powerfully, and as gently for their needs, as IMSA already offers to so many of its students. The Visionary: If you have any plans, I would like to hear them. The Alumnus: Before I give the plans as such, I would like to give a brief overview, not just of the average, moderately gifted, and profoundly gifted mind, but of the average, moderately gifted, and profoundly gifted spirit. Keep in mind that this is not a trichotomy, but three reference points on a curve. The average mind is concrete. It deals in practical, concrete matters. There was one study which posed isomorphic problems to people, one of which was stated abstractly, and one of which asked in concrete terms who the “cheaters” were. The average respondent did poorly on the abstract isomorph, but was astute when it was put concretely. The average mind is more practical, and learns by an understanding which gradually emerges by going over things again. The preferred learning style is oriented towards memorization and is relatively slow, concrete, and (on gifted terms) doesn’t make connections. This person is the fabric with which society is woven; a person like this tends to understand and be understood by others. The average mind concentrates on, and becomes reasonably proficient, in a small number of skills. The moderately gifted mind, around an IMSA IQ of 140, deals with abstractions. It sees interconnections, and this may be related to why the moderately gifted mind learns more skills with less effort. (If this is true, an average mind would be learning from scratch, while a moderately gifted mind would only make adaptations from similar skills.) This person is likely to have a “collection of skills”, and have a low self-assessment in those skills. (Today’s breathtaking performance is, tomorrow, marginally adequate.) Self-actualizing concern for becoming a particular kind of person is much more common. The moderately gifted mind enjoys an advantage over the average mind, and is different, but still close enough to connect. This person learns more quickly, and most of society’s leaders are moderately gifted. (Some have suggested that this is not just because people above that range are much rarer, but because they can easily connect. There is controversy about how isolated the profoundly gifted person is, with an IQ around 180. Some researchers believe that the greater gap is bridged by the greater ability to connect; Webb suggests otherwise, saying that children with an IQ above 170 feel like they don’t fit in anywhere. He asks what the effects would be if a normal child grew up in a world where most people had an IQ of 50-55. Some profoundly gifted have discussed the feeling that there’s an instruction manual to life that everyone but them has. The unusual sense of humor that appears in the moderately gifted is even more pronounced in the profoundly gifted. Average people tend to believe some tacit and naively realistic philosophy. Moderately gifted people tend to believe some conscious and creative reinterpretation of realism. Profoundly gifted people tend to believe an almost automatic anti-realism. The realism assumed by most people doesn’t resonate with them. And I need to explain what I mean by “believe” here. I don’t mean that someone engaged them in a discussion and are convinced by logic or eloquence that an anti-realist philosophy is true. I mean something close to experience, as we believe that a radiator is hot after we touch it. Realism is obvious for someone of average intelligence. For someone profoundly gifted, coming to that perspective represents a significant achievement. The Visionary: You mean is involved with the occult or psychic phenomena? These people do not think of themselves as having magic powers. Their impressive abilities are no more breathtaking or astonishing to them than our impressive abilities of walking through an unfamiliar room or understanding a children’s book are to us—and if you don’t believe that walking through an unfamiliar room or understanding a children’s book is an astonishing mental feat, just spend a year in artificial intelligence. Artificial researchers know what kind of achievement is represented by these “basic” tasks. The rest of us misunderstand them as mundane. If you can understand how you can be better at understanding emotions than any computer in the world, and not think of yourself as gifted, you have a good start on understanding what it’s like to feel that it’s natural to tinker with your hands, imagine who you’re going to be when you grow up, enjoy cooking, and have dreams where your brain creates languages on the fly. It’s a commonplace that the gifted can have a rough time of school. What IMSA does is place the profoundly gifted in the position of fixed pace classes designed for people significantly less intelligent than them. It’s easier to criticize than it is to give a positive alternative; let me give a positive alternative. First of all, profoundly gifted students can pick things up much more rapidly even than most IMSA students. Something like a factor of four speedup can happen again and again. Many of these students would tear through textbooks if you let them. The Visionary: But at IMSA we don’t dump textbooks on students. We provide an environment where they can discover things for themselves. The Alumnus: They will discover things for themselves. But if you look at learning styles, the profoundly gifted are some of the most able to understand a crystallized abstraction, and the most likely to work ahead in their textbooks. IMSA may have a dozen or so profoundly gifted individuals at any one time. The Visionary: And we’ve provided accommodation for a bright sophomore physics class. The Alumnus: Yes, it is possible for students to lobby for accommodation on a specific point. But it’s possible to go further, as IMSA has gone further than TAG pullouts. There could be a small number of people who serve as tutors, in a sort of tutorial system as can be seen in Oxford’s and Cambridge’s history. They would be like thesis advisors, less responsible for knowing what the students need to learn than offering direction and referrals. The Visionary: What would you have them do if they tear through IMSA’s curriculum sophomore year? The Alumnus: Students that bright are likely to have their own axes to grind—good axes, axes which they should be encouraged. I really have trouble imagining a student flying through IMSA’s normal curriculum and then wanting to watch TV for two years. The problem of motivating these students is like the problem of defending a lion: the first thing is to get out of the way. The teachers themselves should offer the kind of individualized instruction that is basic to special education, and deal with the “magic powers” that the main curriculum doesn’t know how to deal with. The Visionary: Would the teachers have to be profoundly gifted? The Alumnus: I don’t know. I would place more emphasis on understanding profoundly gifted students than necessarily being profoundly gifted oneself. Furthermore, as well as standing in need of conceptual education, profoundly gifted students could benefit from personal development to help them meet the rest of the world. I don’t know whether it would be correct to say that average education should be about knowledge, gifted education should be about how to think, and profoundly gifted education should be about personal development. I think the idea is worth considering. And I would try to develop some things that aren’t needed in average education and less needed in moderately gifted education, such as how to bridge the gap and meet the rest of the world. The Visionary: I’ll think about that. I would be delighted to say you’ve shown me how to solve this problem. The Alumnus: I’d be surprised if I’ve shown you how to solve this problem. If I were asked what I could guarantee for this model, it would be that some part of it is wrong. I would ask you to consider what I’ve presented you as a rough draft. In my opinion it is a rough draft worth revising, changing course in midstream if need be, but it is a rough draft. The Visionary: This is all very well for office hours, but how do you teach a class? You don’t try to individualize a lecture twenty different ways, do you? The Alumnus: I believe what I said about diversity as foundational, but I also believe there are things that are common. I believe there are significant commonalities as well as significant differences. What would you say is the dominant educational philosophy at IMSA? The Visionary: There are several philosophies we draw on, and several things vary from teacher to teacher. But if I were to pick one school, it would be constructivism. The Alumnus: Does constructivism see the student as an empty pot, to be filled with knowledge? The Visionary: Quite the opposite. Constructivism sees the students as agents, trying to actively construct their models of the world, not as empty pots to be filled, or as formless clay for the teachers to shape. We see the teacher as supporting the student in this active task. The Alumnus: And I agree that students should be active and encouraged by teachers. A related question—do you believe mathematics is something that research mathematicians invent, or something that they find out? The Visionary: Well, the obvious answer would be that it’s something constructed. The Alumnus: I disagree with you, at least about the “obvious” part. The Visionary: Then I’ll trust your judgment that it’s something mathematicians discover. You’ve probably thought about this a lot more than I have. The Alumnus: You don’t need to agree with me here. There are a lot of good mathematicians who believe mathematics is something invented. The Visionary: Are you saying I should believe mathematics is constructed? The Alumnus: No. There are also a lot of mathematicians who understand mathematics and say mathematics is something that’s found out. The Visionary: Now I’m having trouble seeing where you’re going. The Visionary: I think I see what you are saying… Are you saying that there is a single reality described both by discovery and invention? The Alumnus: Yes. Now to tie in with constructivism… What are students doing when they are constructing models? The Visionary: They are shaping thought-stuff, for lack of a better term, in a way that’s different for each learner. The Alumnus: And this is to break out of the Enlightenment/Diderot encyclopedia mindset which gives rise to stuffing the learner with facts? The Alumnus: Where would you place Kant? Was he a medieval philosopher? The Visionary: He was one of the Enlightenment’s greatest philosophers. The Alumnus: And Kant’s model of ideas was unchanged from Plato. The Visionary: What Plato called “Ideas” and Kant ‘s “ideas” are two different things. For Plato, the Ideas were something strange to us: a reality outside the mind. The Visionary: I don’t think so. Plato’s Allegory of the Cave suggests that the Ideas are part of something that is the same for all people. The Alumnus: If I may digress for a moment, I think that famous passage should be called “the Allegory of the Television.” I appreciate your limiting the place of television at IMSA. But back to the topic, for Plato the Ideas were internal, but were not private. The Alumnus: Kant was a pivotal figure in our—the Enlightenment’s—idea that the only real stuff outside our head is matter. When Kant says “internal,” he says “private,” and when we say “internal,” we say “private.” If you think this way, then you believe that thought is something done in a private corner. This privacy may be culturally conditioned, but it is privacy. And yet, however self-evident this seems to us, a great many philosophers and cultures have believed otherwise. There is a private aspect to thought, but my research into how to think has led me to question the Enlightenment model and believe that we all think on the same contoured surface. We can be on different parts and move in different ways, but in thinking we deal with a reality others deal with as well. And I’m going to sound like a kooky philosopher and say that you have a deficient cosmology, and therefore a deficient corollary understanding of how humans are capable of learning, if you believe that everything is either inside the mind or else something you can kick. The Visionary: But we’re questioning the Enlightenment model, and rejecting parts of it that have problems! The Alumnus: I know you are. And I would encourage you to question more of it. The Visionary: How does this belief affect teaching for you? The Alumnus: Most immediately, it helps me say ways to identify with students—connect with their thought. There are some things that pay off long term. But in the short run, when a student makes a mistake, the student is not bad, nor is the mistake is not an anomaly to push away. A mistake is an invaluable opportunity for me to understand how a student is thinking and draw the student to a better understanding. In terms of base metaphor, if you look at Dewey’s foundationalism, what it is that bothers many IMSA teachers and IMSA teachers are working to change, the basic idea is that the teacher is building up knowledge, from its foundations, in the student’s mind. If I were to try and capture it in a metaphor, I would say that the student is an empty lot, and the teacher is building a house on it. The teacher is actively doing teaching to the student. The constructivism that resonates with many IMSA teachers doesn’t like the idea of the teacher being active and the student being the passive receptacle of teaching. It’s fine for the teacher to be active, but they don’t believe the student is passive because they were quite active learners themselves. Constructivist writers don’t refer to ‘students’ so much as ‘learners;’ they emphasize that the learner is active. The basic idea is that people are actively trying to build their own unique understandings of the world, and a constructivist teacher is trying to support learners in this endeavor. If foundationalism is crystallized in the image of a teacher building a house on an empty lot, constructivist learning theory is crystallized in the image of learners picking up what they can to build their own private edifices of thought, their interior castles. The Visionary: What do you think of those? The Alumnus: I think we’re comparing a hammer with a screwdriver. If you read debate on the web, you’ll see people who think constructivism is a hazy and incomprehensibly bad version of foundationalism, and people who think foundationalism is a hazy and incomprehensibly bad version of constructivism. The truth is neither; good foundationalist teaching like Direct Instruction is doing one thing well, and good constructivist learning is doing another thing well, and different people learn differently. The Visionary: But do you have an alternative? The Alumnus: But it’s different. I was fascinated with one constructivist learning page that recast the teacher as a sort of non-directive counselor. They facilitated learning experiences, but they realized that students came in with beliefs, like “Weeds are not plants because they don’t need to be nurtured,” and what really fascinated me was that some of them found themselves in an ethical quandary about the appropriateness of using a science class to influence student beliefs, say to agree with a botanist that dandelions are plants. The Visionary: None of the IMSA teachers are that squeamish about influencing student beliefs. The Visionary: But what do you have instead of helping students build private world-pictures? The Alumnus: Instead of helping students build private world-pictures, helping students grapple with, in the overcoming that is understanding and the understanding that is overcoming, the katalabein of material. And this is material that always has a personal touch, but is understood to be internal in a way that is not simply how one has arbitrarily exercised privacy, but connects with a sort of inner terrain that is as shared as the outer terrain. No two people are at—no two people can be at—the exact same place in the external, physical world, nor can two people see the same thing, because their personal bodies get in the way. But that does not mean we inhabit our own private physical universes. I can tell you how to drive to my house because to get there, you would be navigating some of the same reality as I navigate. But somehow we believe that our bodies may touch the same doorknobs and our shoes may touch the same carpets… Somehow we believe that when we turn inside, the “reality” becomes impenetrably private, influenced by culture perhaps but shared to so little an extent that no two people shares the same inner sun and moon. The Visionary: But that’s the external world! You’re not talking about when people can make up anything they want. The Alumnus: Hmm… As part of your job, you field criticism from people who want IMSA to be shut down, right? The Alumnus: And a good portion of that criticism comes from people who are certain you’ve never considered the objection they raise, right? The Visionary: You’ve been reading my mail! The Alumnus: And how many years has it been since one of those letters contained a criticism that was new to you? The Visionary: You’ve been reading my… um… [pause] Wow. The Alumnus: The introduction to the Handbook of Special Education tries to make a point by quoting the opening meeting of the International Council for the Education of Exceptional Children. The meeting had in all respects a typical (for today) discussion of how one should define special needs children. And the meeting was in 1923. The point was made that special educators assume they’re the first people to address new issues, when neither the issues nor their thoughts are new. An old internet denizen, writing about “the September that never ended”, talked about how each year in September new college students would flood newsgroup discussions with “new, new, new” insights that were, in the denizen’s words, “exactly the same tripe” that had been posted the previous year. The Visionary: Is there a way to integrate the inner world with the outer world? The Alumnus: I am guilty of a rhetorical fault. I have spoken of the outer world as if it were separate from the inner world, and the inner world as if it were separate from the outer world. The real task is not one of integration but desegregation, and that is a lesson I’ve been wrestling with for years. The biggest lesson I took from my Ph.D. thesis, where I achieved a fascinating distillation of how to think from learning as we know it, is that how to think cannot be distilled from learning, and learning cannot be distilled from the rest of life. It is all interconnected. It’s like a classic plot in fantasy literature where a hero is searching for a legendary treasure, and goes to strange places and passes amazing trials. We’re there learning with him, until there is an end where “nothing” happens, but by the time that “nothing” takes place, we’ve been with the hero all along and we have been transformed just as much as he is, and we see through the “nothing” to recognize the treasure that has been all around the hero—and us—all along. The real world has an internal and an external dimension, and there is nothing like trying to crystallize purer and purer internal knowledge to see the interpenetration of the internal and the external. I learned that the internal is not self-contained. The Visionary: Is there anything that has been written which deals with this connection? The Alumnus: Are you asking me if you can borrow a truckload of books? There are some cultures where it’s hard to find material which doesn’t relate the connection in some form. But let me tie this in with education. Postmodernism is fragmented, so much so that postmodern scholars tend to put “postmodern” in ironic quotes and add some qualifier about whether it’s even coherent to talk about such a movement. From the inside, there isn’t a single postmodern movement; talking about a postmodern movement is like talking about a herd of housecats. But this is not because talking about being “postmodern” is meaningless; it’s because one of the characteristics is fragmentation, and so if there is anything called postmodern, then it will be much more of a grab bag than something called modern. In what I am suggesting, learners are active, but students are working with something which is not so much clay to be shaped in the privacy of one’s mind. I am aware of the parochial dimension—as a culture, we’ve been aware of it to death—but I’m trying to look at something we don’t pay as much attention to today. I suggest, instead of a basic metaphor of learners constructing their own models, learners struggling to conquer parts of the world of ideas. Conquer means in some sense to appropriate; it means in part what we mean when we say that a mountain climber physically conquered an ascent and mastered its terrain. And this is not a cookie cutter, but it provides serious place for something that doesn’t have soil to root itself in in constructivism. I suspect that this is a lot less exotic than it sounds. Would you say that IMSA teachers often understand their students? The Visionary: I think they often try. The Alumnus: I think they often succeed. Communication in general draws on being able to identify with the other. It says, “Even if I disagree with you, I understand what it means that you believe differently from what I do.” You know what it’s like when someone is talking with you and simply cannot identify with where you are coming from. It feels clumsy. Good communicators can identify with other people, and even a partial understanding is much better than no understanding at all. I think the teachers I had at least showed something wiser than constructivism. Read something like Kuhn’s The Structure of Scientific Revolutions and you will see appreciation of incommensurability and a communication divide between opposing camps; unlike the later Kuhn, you will also see that this claim of incommensurability, where opposing sides invariably argue past each other in debates, is applied to both major and minor paradigm shifts. Now if we look at a constructivist approach, where this kind of thinking is applied to individual peoples’ models as well as models that are shared across a camp, then we have an excellent reason not to teach. We have an excellent reason to say that teachers’ and students’ models are not only conflicting but incommensurable, that the teacher may have more power but in a fair debate they would argue past each other, and that the basis for the teacher understanding and therefore successfully influencing the student is at very least questionable. In the end, we have something which affects the concept of teaching more profoundly than the observation that students will see things that teachers don’t realize. If you look at Kuhn, you will see a remark that the winning side of a scientific paradigm shift will naturally view the shift as progress. This contributes to an account for people thinking science progresses without science actually progressing. Science shifts. But the shift is not a step forward from less developed science to more developed science. It is a step sideways, from one reigning paradigm to another. And in like fashion, if you follow a natural constructivist path, you have an alternative to saying that the teacher knows more about science than the students. The teacher is more powerful, but there is a way out for someone who wants to deny that the teacher has more desirable knowledge that the students should learn. Not only can we argue that “teaching” communication is impossible, but we can argue that “teaching” communication is undesirable even if it were possible. The Visionary: But that can’t be what our teachers believe! You have to be misunderstanding constructivism. That’s not how it works out. The Alumnus: I agree with you that that can’t be what many IMSA teachers believe. It is only what they say. And what they think they believe. The Alumnus: Foundationalism is a bad account of how most IMSA teachers learn. They learn actively, and IMSA students learn actively. And constructivism offers a compelling metaphor for active learning. But teachers at IMSA don’t believe all its implications. Like the character in a George MacDonald book who was fond of saying, “Marry in haste, repent at leisure,” and had married in haste, but hadn’t really thought about repenting, even though she’d had plenty of leisure in which to repent. If constructivism may undercut the possibility of communication, and the possibility of the teacher drawing students to join her in expert practice, this is not yet a problem. In practical terms, teachers believe they can communicate, and they have something to share. And they do this. There may be problems where this goes down the road, but in practical terms IMSA teachers live a philosophy with communication that is often excellent. And, as far as metaphors go, I think that the katalabein metaphor offers something valuable that the constructivist metaphor doesn’t. In particular, the fact that teachers can communicate, and leave students better off, doesn’t just happen to be true; it’s something that one can delve into. You don’t just take the metaphor into consideration when you communicate on a basis that doesn’t come from the model; the metaphor itself gives you a basis to communicate. And it’s different enough to compete in an interesting way. Or complement constructivism in an interesting way. Even if it’s not perfect. The Visionary: Yes, I know. Do you regret the fact that it’s so messy? The Alumnus: I regret the fact that it’s not messy enough. When we describe a rainbow, we say that the colors are red, orange, yellow, green, blue, indigo, and violet. But those aren’t the colors of the rainbow. If you pick a color at random on the rainbow, there’s a zero percent chance that you will exactly pick one of those colors. A rainbow is a spectrum, and if you have a wavelength for each of those colors, you have seven reference points for a spectrum with infinitely many colors. And a reference point can help you understand a spectrum, but a reference point is not a spectrum. I’ve done, I think, a decent job of describing one reference point on a spectrum. But teachers rarely follow one educational theory in pure form; they tend to draw on several, and this is intended not to be a complete theory, but a reference point in a pluralistic theory. Most theories are a single point. This theory is meant to be a spectrum, but isn’t there yet. And as much as a robust theory of education needs to be pluralistic, sensitive to the diversity that is every student, there also also needs to be a sensitivity to the diversity of knowledge. English is cursed to only have one word for knowledge. The Visionary:But we have well enough established division of knowledge into subjects. In fact that’s what we’re trying to teach our students to get past. The Alumnus: That’s not quite what I meant. In most of the languages I know, there’s more than one word for knowledge. In French, there is savoir, which is the knowledge one has about facts, and connaissance, which is the knowledge one has of a person. It’s a different kind of thing to know about a fact and to know of a person, and this is reflected in different words. Conscience is not simply the French word for conscience; it means consciousness, and some of the more ethereal and personal aspects of knowledge. The Latin eruditio and notitia have other nuances. In English we do have “wisdom,” “knowledge,” and “information,” which are as different from each other as an apple, an orange, and a pear. And this is without treating ways of thought. One of the things I learned was that knowledge and ways of thought could be distinguished but not separated. If you look at Eastern ways, whether they are religions like Hinduism or Eastern Orthodoxy, or martial arts like Kuk Sool Won or Ninpo, you will find quite a different pedagogy from what we assume in the West. Instead of trying to open the mind and dump in knowledge, they begin by training the body, in actions, and then this begins to affect the soul and transform the spirit. The Visionary: Isn’t constructivism more like that? The Alumnus: It is. But instead of reinventing experiential learning, Eastern ways preserve a Tao, or for a Western word, a matrix. Most recently in the West, Matrix is the name of a trilogy where each movie was better than the next. But before that, a matrix was a mathematical construct, and are you familiar with what “matrix” meant before that? It was the Latin word meaning “womb.” And this concept of a womb, or a matrix, is something which has become alien to Western thought. A matrix is the medium in which you move, the air in which you breathe. It has the authority of your culture and your mother tongue. It is a very different kind of authority from the authority of a single leader, or a written rule; a matrix does not consciously command you, but provides you with the options which shape your choice. And the Eastern ways all preserve a matrix, a way, that provides their pedagogy. In a sense the difference between constructivist experiential learning and Eastern experiential learning is the difference between non-native speakers trying to speak a language and a community of native speakers continuing to use their language. Except to make the comparison more fair, constructivists are trying to construct a language, and put together something that works, and Eastern pedagogues have inherited something that works. The difference is kind of like the difference between an experimental kind of baseball glove that someone is trying out and a glove that is not only traditional but already broken in. The Visionary: Um… I’ll have to think about what you have said about a “matrix.” Ok, you’ve given me a lot to think about. It would be premature for me to respond now. I’m going to need to think about what you’ve said. But let me change the susbject. What other ideas do you have about teaching, especially concrete ones? The Alumnus: It’s a bit like a light—it makes other things easier to see. But let me talk about other ways of teaching, such as listening. The Visionary: I know how you can listen if a student asks a question, but how do you listen when lecturing? The Alumnus: Listening is about trying to understand the other person as a basis for communication. Apart from the feedback that’s in student questions—if you look for it—a person’s face is a window to what is going on inside, and a teacher sees student faces frequently. I know the ominous silence when the class is so lost that students are afraid to ask questions. I don’t just charge on because it’s important to cover the remaining material. I try to stop, back up, and help the students to genuinely understand, and then proceed from genuine understanding. Homework offers implicit feedback on what I succeeded in communicating, and what I did not succeed in. And there’s an implicit listening mindset behind trying not to inundate students with too much information at once. There’s a book of little stories, and in one of them, a sage was asked, “What is your name?” He pondered for a moment and said, “My name used to be… Me. But now it’s… You.” I didn’t like that story at first, because I didn’t understand it. Now I understand enough of it to see that it has a profound truth. Talking is about “me”, and listening is part of a lifelong journey of learning to think in terms of “you.” Listening has far more to offer a teacher than a better understanding of student questions. The Alumnus: Any time. But I really like the understanding you have of the human person as interconnected on multiple levels, including the body and mind. I also take that as axiomatic, and teach so that students will understand concepts and preferably their connections, and many other things. Just as I haven’t read what I just said about listening in anything that came out of IMSA, but the teachers I had at IMSA were all examples of good listening. But another part of the Enlightenment I reject is its depersonalization of knowledge and teaching. Have you read any Polanyi? The Visionary: Not yet. Should I put him on my reading list? The Alumnus: I don’t know. He writes hefty, if understandable, material. It takes time to understand him, but he’s worth understanding. Michael Polanyi was a philosopher of science, and his big work was on tacit and personal knowledge. The core idea is that scientific knowledge (I would say knowledge in general) is not a set of dessicated constructs that can be understood without reference to people; it is enfleshed in people who know it. He talked about how competing swimmers inhale a little more air and exhale a little less, so they always have more air in their lungs and therefore buoyancy than we would, but this knowledge is never thought of in so many words by the coach or by the student who “picks it up” from the coach, wordlessly. I don’t know if it’s a fair reading to say that the knowledge we can articulate is the just tip of the iceberg, but what I do think is a fair reading is to say that the knowledge we can put into so many words is not the whole picture. I think he would have liked IMSA trying to avoid teachers mindlessly regurgitating material so students can learn to mindlessly regurgitating material. In tandem with the Enlightenment depersonalization of knowledge, is a depersonalization of the concept of teaching and a teacher. About two thousand years ago, one teacher tried to demote teachers from being human gods (who were superior to everyone else) to being human like the rest of us. Then, in connection with the Enlightenment there came a second demotion. A teacher was no longer someone responsible for initiating those in their care into humanity, but only a part of a person imparting a skill to another partial person. This means that a teacher who sees past the present, and sees students as the concert pianists, research scientists, and ballerinas they can become, will by that very respect help make that potential a reality. The Visionary [looks at watch]: Thank you. I need to be somewhere in a few minutes; do you have any closing comments? The Alumnus: I think that one aspect of how we speak of teaching is unfortunate. We speak of the active teacher who teaches, and the presumably passive student who is taught. Nothing of this manner of speaking suggests a dialog, a two-way street—but if teaching succeeds, it must be because of a cooperation between student and teacher. Even with constructivist understanding of learning, we’re just looking at what the teacher can do. Prometheus stole fire. Your job is to steal knowledge. The wrong way to think is that my job is to teach you, and you just sit there and be taught, and after enough teachers have taught you, you’ll be educated. You will get a much better education if you think that whatever I do, however well or poorly I teach, is simply the baseline, and you can start from there and see what you can do to take as much knowledge as you can. Listening in class and asking questions is one way to steal knowledge. Is there something I said that doesn’t quite make sense? If you just let my teaching wash over you, you’ve missed an opportunity to steal knowledge. If you listen to my words, that’s good. It’s even better if you think about why I would say what I am saying. There may be a clue, maybe a little whisper in your intuition that something more is going on than you realize. That is a key that you can use to steal knowledge. When you read the textbook, it will tell you more if you push it harder. Look at the problems. What are they asking you to know? What are they asking you to think about? There’s a powerful clue about what’s important and what’s going on, if you’re adept enough to steal it. What do I assume about the material? I make assumptions, and some of those are assumptions I make because of what I know. If you’re willing to ask why I assume something, you may steal knowledge of how people think when they understand the material. My office hours are meant for you. Come in and discuss the material. If I see you make a mistake, that’s good. It means you’re learning and I have an opportunity to clarify. If you don’t understand something, and all of us don’t understand things from time to to time, it will cost you points to wait until the test to find out that you don’t understand it. It won’t cost you anything if you come in during my office hours, and I’ll be glad you visited. And you might steal some knowledge. Steal knowledge. There’ll be some days when you’re a little tired, and you can’t look for all the extra knowledge you can steal. That’s OK; just try to take the knowledge I clearly set out before you. But steal knowledge when you can. You’ve gotten into IMSA, which is one of the best and one of the worst places in the world. Take advantage of opportunity. Learn to steal knowledge. And when you graduate from IMSA… Steal knowledge. The Visionary: I definitely have some food for thought to take into the meeting. Do come and visit again! Goodbye! The Alumnus: That I shall. Goodbye!